Large Gray- wrinkled skinned, sparse haired, large African continent shaped ears, and a concave sloped back. Both male and female African elephants have large tusks. 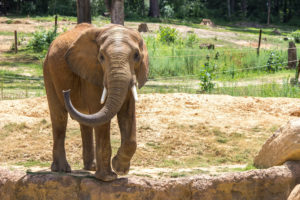 In the wild, African elephants have a life expectancy of 25-41 years, but have been known to live up to 60 years of age. Primarily grazers, eating plant material from grasslands, scrub and forests form Africa. An African elephant family group can average 8-10 individuals. In general, older, experienced females, called matriarchs, lead elephant families. These female-led herds usually consist of adult daughters, their calves, and a number of juvenile and adolescent male and female offspring. Female herd members are usually related, but occasionally non-related individuals join to form families. Young females often assist their mothers with calf care and provide allomothering for younger calves in the herd. Since female elephants are known to remain reproductive throughout most of their lives, this is their primary activity beyond eating and drinking. Female elephants also appear to maintain lifelong relationships with their immediate relatives, particularly their female offspring. Males spend as much as 95% of their lives alone or in loose association with other bulls. Elephants are highly intelligent animals that display complex social behaviors such as greeting ceremonies, group defense, submission, tactile contacts, vocal communication, scent communication, social play, courtship, mating, birthing, parenting, communal care, teaching, threat displays, charging, and fighting. Elephants produce a variety of vocalizations including trumpets, squeaks, chirps, and low frequency rumbles. Rumble vocalizations contain frequencies that are below the range of human hearing (infrasonic components). These low frequency calls can travel several miles and may be used to coordinate their movements. Females may also use these calls to announce their willingness to breed.